Dance to reggae and its sub-genres: classics that introduced Jamaica’s music to the world, the new reggae revival movement, Roots, Dub, Lovers Rock, Rocksteady, Ska, 70s, 80s, and 90s reggae dancehall music. Enjoy good vibes only by Highlanda Sound and DJ Passport, along with guest DJ sets by Atlanta’s John Wayne and Isis Swaby from NYC. ROCKSTEADY ATL – Reggae Music Events: Highlanda Dot Net and The Honorary Citizen in association with Rockers International Records present RUB-A-DUB. Sept. 11, 2016 and Every month on the second Sunday of the month – 8 p.m. start. A style of Jamaican Reggae emerging in the 70’s and 80’s, the term “Rub-a-Dub” comes from a dance style where the man and woman rub up very close together. 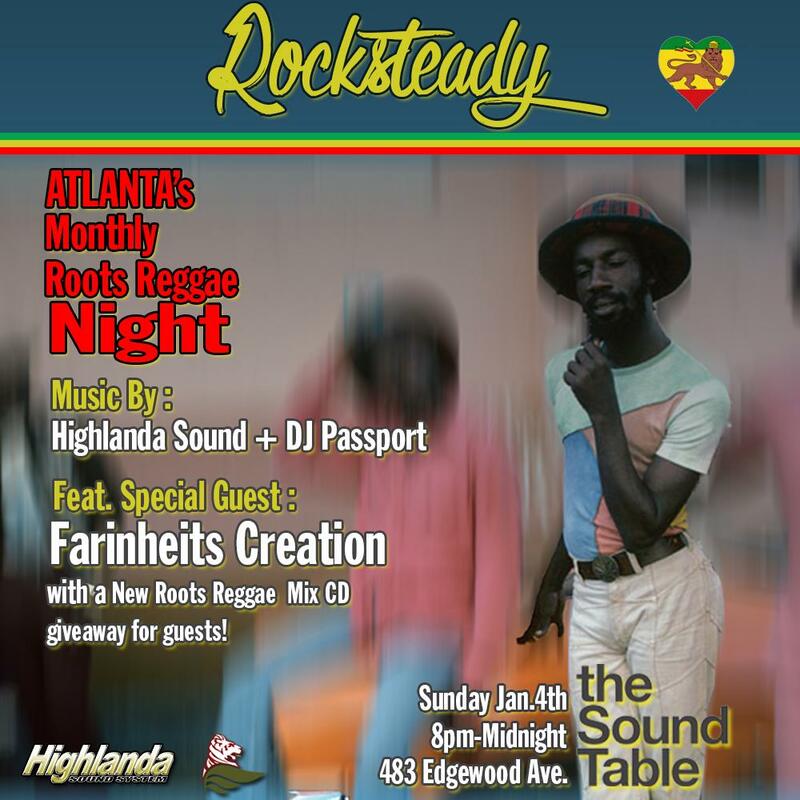 Join us at the Sound Table this Sunday January 4th for a mix of Early Reggae, Classic Dancehall hit music, Rocksteady and Ska, dub, the New reggae revival movement, roots and culture plus lovers rock Music by: Farinheits Creation, DJ Passport of The Honorary Citizen and Highlanda Sound System from 8pm – Midnight.